Defolians est genus herbicidae quod efficit ut folia decidant. 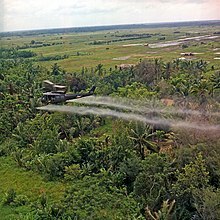 Hic, helicopterum defoliantem silvae tropicae in delta Mekong 26 Iulii 1969 aspergit. Silvicida est pesticida ad vigulta, arbores, silvas, vel quasdam species silvaticas ingratas interficere adhibitus. Moleculae activae ad plantam per folia, radices, vel corticem penetrare possunt. Allard, J. 1974. Arsenical silvicide effects on human health. Maurice, W. 1965. Cacodylic acid as a silvicide. Aspen Bibliography, 5937. Tarrant, R. F., et J. Allard. 1972. Arsenic levels in urine of forest workers applying silvicides. Arch. Envir. Health 24:277–280. Wiant, Harry V., et Laurence C. Walker. 1964. External Applications of Silvicide Paste Kills Oaks. Journal of Forestry 62(7):455, 1 Iulii. Society of American Foresters. Vicimedia Communia plura habent quae ad herbicidas spectant.